Animalia, with it's outstanding art and attention to detail, is sure to inspire all of the young artists in your life. This is my go-to gift for every family member or friend who has an important little one in their life. A hidden land of beasts and birds . . .
Animalia is a book like no other. Abounding with fanciful, gorgeously detailed art, it is an alphabet book, a guessing game, and a virtual feast for the eyes. Each page features one letter and images related to that letter—as well as a hidden picture of Graeme Base as a child! Animalia will entrance any child or adult who enters its fantastical world. Graeme Base is one of the world’s leading creators of picture books. 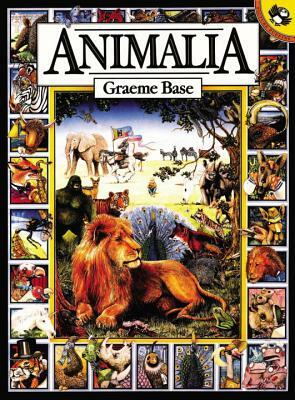 Animalia received international acclaim when it was first published in 1986 and it has achieved classic status with worldwide sales of more than two million copies. Base’s most recent picture book, The Water Hole, an ingenious fusion of counting book, puzzle book, storybook and artbook, has been published in Australia, the USA, Canada, Italy, France, Denmark and the UK. Base lives in Melbourne with his artist wife Robyn and their three children.